Last Chance: Copies of Kirby Collector #12-22 on sale now! We just acquired one final stash of a few copies of Jack Kirby Collector #12-22, and I’ve added them to our website for immediate ordering. THIS IS YOUR LAST CHANCE TO GET THESE RARE, SOLD-OUT ORIGINAL ISSUES! Please note: They’re not in “mint” condition, but are all in decent shape (with minor cover scuffing in some cases), and fully readable. PLUS: They’re priced at 15% off their original low $4.95-$5.95 cover price. Just go to this link to order, but DON’T DELAY, as they’ll be gone quickly! This entry was posted in TNT on 30 November 2010 by Mr. Morrow. 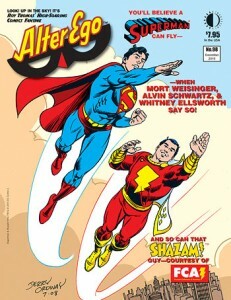 Alter Ego #98 just went to the printer, featuring heavy coverage of Superman’s Silver Age editors and writers. You can take a sneak peek by downloading a FREE 6mb PDF preview of the issue at this link, or you can access a nifty new online FLASH-based preview at this link. The full issue is available for pre-ordering directly from TwoMorrows at this link (print customers will receive a free link to the digital edition), and it goes on sale in comic book stores on Wednesday, December 8. This entry was posted in TNT on 11 November 2010 by Mr. Morrow.